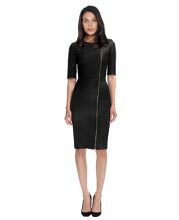 This petite short-sleeved leather dress presents a blend of style and elegance. It features a crew neck, an exposed double zip fastener on the front with a natural waist design. An exposed zip trim at the back of each sleeve along with combination insets on each side enhance the overall shape, giving it a demure and sophisticated look.